Eva Schicker, Lotus Tree Valley With Sun & Moon, 2018. As a painter, I have a profound interest in the Asian tradition of Thangka painting. This technique has enabled me to refine my style to narrative painting. My depictions of nature scenes represent the philosophy of harmony, beauty and tranquility. Through my painting, I express a poetic place of comfort. 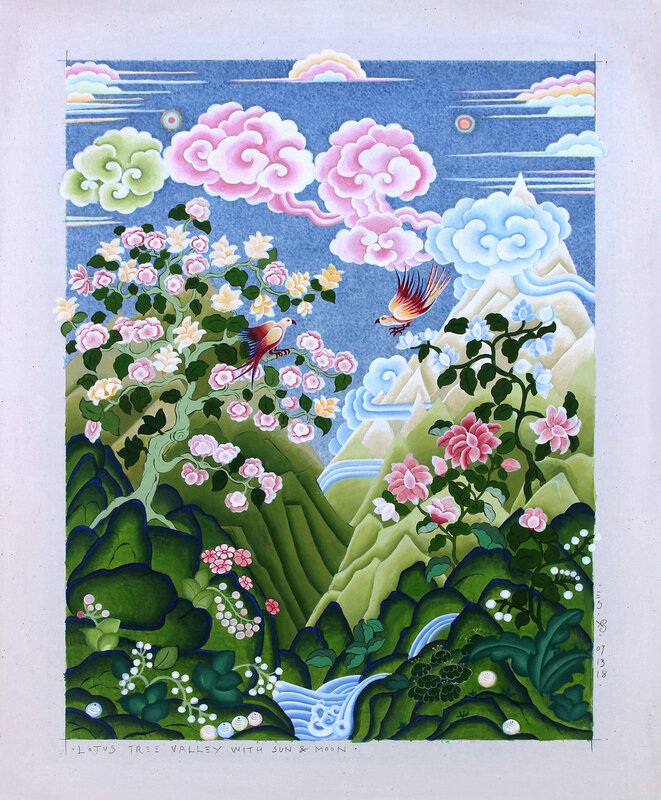 Rocks, clouds, water, trees, flowers and animals are featured prominently in Thangka painting. Each element expresses a property that follows us through life. Rocks symbolize the steadfastness, clouds depict the air and the spirit of life, water symbolizes life’s abundance, and nature shows us the interdependence of all beings. We are pleased to announce that Eva Schicker’s painting Lotus Tree Valley With Sun & Moon will be on exhibit at the Williamsburg Art & Historical Center (the WAH Center) in Williamsburg. This show is Part 3 of the Yuko Nii Permanent Collection series. The show features works from the collection of the Yuko Nii Foundation, acquired between 2010 and 2012. It also features new works by artists in the collection. Eva Schicker has been with the ethan pettit gallery since its founding in 2012. She has exhibited internationally and with many New York City galleries over the years. She was the recipient of a NYFA grant for her early-career experimental films. Yuko Nii has been a visionary of the Williamsburg art world since the early 90s, when she founded the WAH Center. Over the years, Yuko has assembled nearly a thousand works by local artists. It is a collection that forms a sweeping picture of Williamsburg. A comprehensive catalogue with essays by Yuko Nii and WAH president Terry Lindall will be on sale at the opening. Yuko Nii’s essay reveals the early Williamsburg art scene and how it all began, with Ethan Pettit and Genia Gould starting the lurid, uncensored Waterfront Week, and the appearance of break-away thinkers such as Ebon Fisher. She further describes how her collection grew and provided the context for much writing and thinking. This exhibition is a must-see event. Not only does it shed light on the important early years of the WAH Center and the Yuko Nii Foundation, it also continues the important work of providing space to an artistic dialogue. Catalogue of Selected Contemporary Works from the Yuko Nii Foundation Permanent Collection. Please consider supporting Yuko Nii’s vision by buying the catalogue, or by becoming a friend or supporter via the online link.